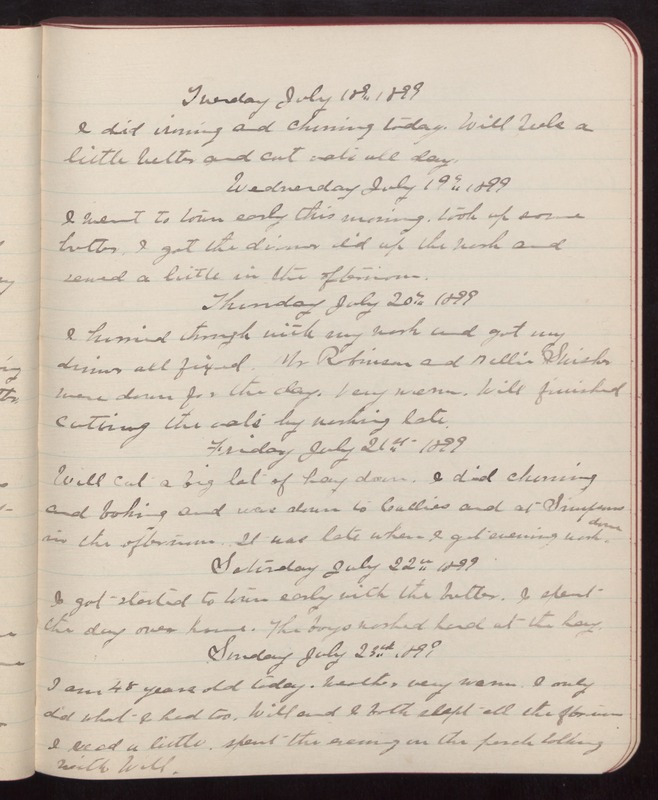 Tuesday July 18th 1899 I did ironing and churning today. Will feels a little better and cut oats all day. Wednesday July 19th 1899 I went to town early this morning. took up some butter. I got the dinner did up the work and sewed a little in the afternoon. Thursday July 20th 1899 I hurried through with my work and got my dinner all fixed. Mr Robinson and Nellie Swisher were down for the day. Very warm. Will finished cutting the oats by working late. Friday July 21st 1899 Will cut a big lot of hay down. I did churning and baking and was down to Callies and at Simpsons in the afternoon. It was late when I got evening work done. Saturday July 22nd 1899 I got started to town early with the butter. I spent the day over home. The boys worked hard at the hay. Sunday July 23rd 1899 I am 48 years old today. Weather very warm. I only did what I had to. Will and I both slept all the afternoon I read a little. spent the evening on the porch talking with Will.